Select the Internet Email (or Pop or IMAP in Outlook 2013) option and click Next. Account type. Select the POP3 option. Incoming mail server. Type your domain name. For example, example.com or mail.example.com. 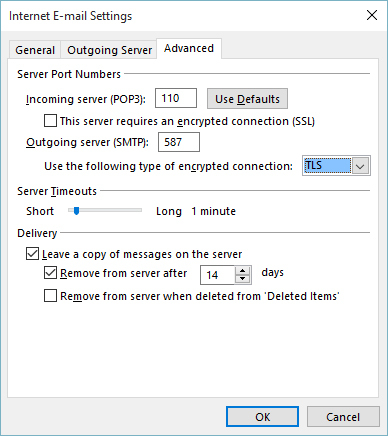 Outgoing mail server (SMTP). Type your domain name. For example, example.com or mail.example.com. Do not check: Require logon using Secure Password Authentication (SPA). Choose 587 for the port and TLS connection. Click Next, Outlook should test sending and retrieving emails and both tests should be completed (contact us if it’s not the case).